This manual gives you a walk-through on how to integrate your own calculations using cxcalc. 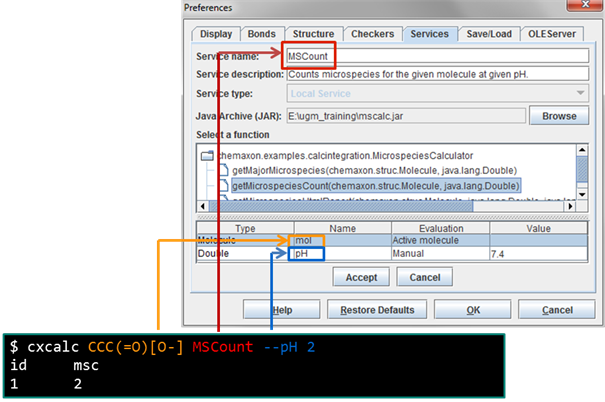 Cxcalc is a command line tool that can perform chemical calculations in batch mode. It can invoke all calculations that are available in MarvinSketch, and since Marvin version 5.6 it can also run external services. 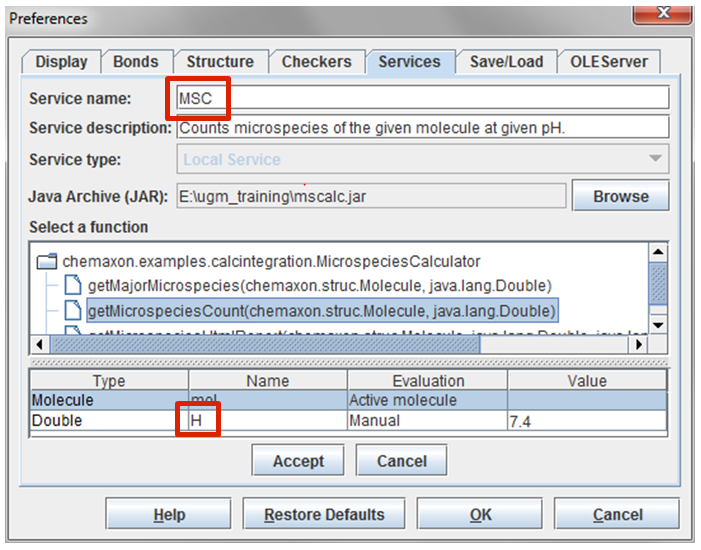 As Marvin saves the configuration of the services into an XML file, services that were previously set can be used in cxcalc without any further setup. To execute the external service in cxcalc its name or the alias of the service can be used to execute it. To see the help of a service calculation in cxcalc, execute the cxcalc <name> -h command, where name is the name of the calculation. As an example see the command line help for the hellomolecule command. The following example illustrates the connection between the service and cxcalc parameters. In this case we want to calculate the number of microspecies at a give pH for a molecule. The default settings can be overwritten during the set-up. Next we will modify the name and parameter names of the MSCount calculation. After the modification the calculation is also accessible as MSC, and the -pH command line parameter can also be referred to as --H, too. Built-in and external calculations can be called at the same time, too.